New issue! Our Jan/Feb issue is finally out (shipping to print subscribers now; already emailed to e-subscribers). It may be our funniest issue ever! 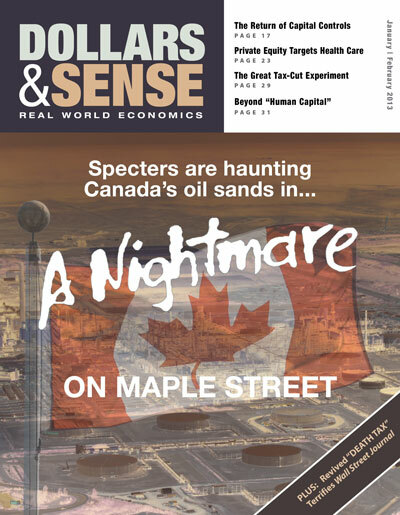 (Ok, it’s not clear how to evaluate that claim about an economics magazine…) Maurice Dufour, author of our cover story on the nightmare that the oil sands have become for Canadian elites, has outdone himself this time. And John Miller’s column, on the WSJ editors’ conniption over the not-so-scary-after-all revival of the estate tax in the fiscal cliff tax deal, is also a hoot (“Resurrection of ‘Death Tax’ Not so Rapturous”). We have posted two articles from the issue: a Comment by Robin Hahnel, The Formerly Advanced Economies, and Jerry Friedman’s Economy in Numbers, The Great Tax-Cut Experiment. in power really believe this utopian story, the results can be downright scary. Armagan Gezici’s article on capital controls describes the fallout from unregulated international finance. Volatile international capital flows (often short-term speculative or “hot money” investment) from rich countries to poor can hurt the latter’s international competitiveness, destabilize their financial systems, and exacerbate business cycles. None of these contributions merely bemoans the current state of affairs. In each case, there are answers. Dufour describes environmental opposition to oil-sands extraction and related pipelines that actually has the Canadian government running scared. Aschoff describes opposition to PE takeovers from nurses’ unions. Gezici describes the resurgence of capital controls—regulations on international capital mobility—in numerous developing countries, and the positive effects they have had in taming capital flows. The regulars for this issue, similarly, tackle key policy prescriptions of the free-market fundamentalists. In this issue’s “Comment,” Robin Hahnel warns that fiscal austerity in Europe, Canada, and the United States risks turning these into “formerly-advanced economies.” In “Active Culture,” freelance journalist and D&S collective member Dan Schneider profiles the anti-debt movements spawned by Occupy Wall Street. John Miller’s “Up Against the Wall Street Journal” takes down the myths about the return of the estate tax—which is neither what the Journal claims to fear nor what the left might have hoped for. Gerald Friedman’s “Economy in Numbers” makes a related point—tax cuts for the rich have not actually resulted in greater investment, higher productivity, or faster growth, as their advocates claimed they would. In “Ask Dr. Dollar,” Arthur MacEwan takes on the “neoliberal” reform of education, in which students, teachers, and schools are all to be motivated by fear (of failing, of being fired, or of being shut down). The so-called reformers extol the “discipline” of the capitalist market and the capitalist factory. These articles all deal with major challenges about what kind of society, and what kind of world, we want to live in. One in which the international mobility of capital is sacrosanct, whatever havoc it may wreak? One in which the riches under the ground count for more than the environment above it? In which financial profit comes before human health? In which the majority are saddled with crushing debt and fed the message that, if they can’t pay, they are no good? In which the richest get their tax cuts whether it suits the rest of society or not? In which education is no more than a way to create more productive cogs for industry? That may be someone’s idea of utopia, but it isn’t ours. We are likely to post one or maybe two more articles from the issue online, but to get it all, you should subscribe. With an e-subscription (same price as a U.S. subscription, so a good deal for non-U.S. subscribers), we’ll send you a full-color pdf of each issue, with the current issue as a bonus if you subscribe soon. With a sustainer subscription ($60/year, $120/two years), you can help cover what it actually costs to put the magazine out. I am overdue for a post on some great stuff that’s come across my desk (or my computer’s desktop), including some links to great stuff related to Jerry Friedman’s piece on tax rates. (The blog was disabled for a few days, and before that we were rushing to finish the issue.) I will do a post or two in the next couple of days. Previous Previous post: Is Paul Krugman’s Liquidity Trap Really an Inequality Trap? Next Next post: Minimum Wage, Bankers’ Accountability, etc.